What is a pastor – or a church body – to do as their country falls apart? It’s a very real question for Rev. Miguelángel Pérez, president of the Lutheran Church of Venezuela (LCV) and for Rev. David Ernst, an LCMS pastor called to serve the LCV. 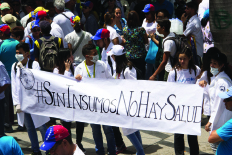 Shortages of medicines (sign above reads “Without supplies, there is no health”) and food, the Venezuelan people are growing increasingly desperate. Once a prosperous country, Venezuela today is in turmoil, its citizens suffering through food shortages, lack of government services and most recently, the collapse of Venezuela’s electrical grid. “Our members are in the same condition as 80 percent of the population…they have only enough to afford food, since the minimum wage of $7 per month does not cover medicine, clothes or other essentials. There are no medicines for chronic diseases (such as hypertension, diabetes, etc. ), and no vaccines,” said Rev. Pérez. Rev. Ernst, who serves Epiphany Lutheran Church in the village of La Caramuca, witnesses the same things. “The situation is just getting more and more chaotic,” he recounted. “Everything is in short supply. In the shops that are still open, there’s nothing in their inventory. The shelves are bare. There’s a neighborhood bakery where people go to buy fresh bread every day, but now they’re saying that Venezuela is the only country where, when you come to the bakery, you need to ask, ‘Is there bread today?’ because there may not be. Under such difficult circumstances, more than 4 million people – mostly skilled and educated people – have fled Venezuela. Many would understand if Rev. Ernst and his wife, Luz Maria, were to follow, but they are committed to staying and serving. This message of hope – of a heavenly Father who loves His dear children and is faithful to them through all earthly troubles and strife – is being delivered through LHF books like the Spanish Bible with Small Catechism and children’s Bible storybook, A Child’s Garden of Bible Stories. More than 8,000 books have been sent to the LCV, and they’re being delivered to the LCV’s 19 congregations as circumstances allow. 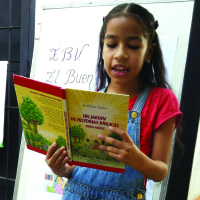 Venezuelan girl reads “A Child’s Garden of Bible Stories” in Spanish. Rev. Ernst said his congregation presents the Bibles to new confirmands. His wife uses the Spanish A Child’s Garden of Bible Stories to teach religion to her 25 students in their church preschool and to the 15-20 children enrolled in after-school tutoring. “A lot of children in the after-school programs are in advanced grades, but they really can’t read that well,” Rev. Ernst said. “So we’re killing two birds with one stone: we’re teaching them the Christian faith, but we’re also teaching them to read.